This couple is enjoying Sausal Creek burble at their feet as it runs through Dimond Park. Most of Oakland's creeks were put underground years ago. The creek's riparian community is being restored by volunteers. The park itself, situated in the Dimond District, offers various play activities and is situated on the ancestral land of the Dimond family who settled in 1867. When walking to my car near Chinatown, a flash of red caught my eye. 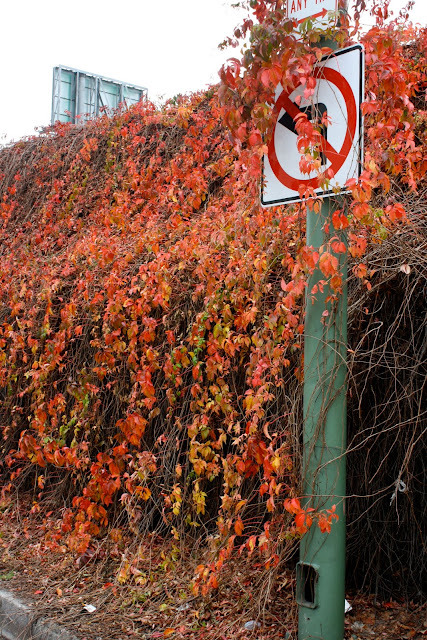 This ivy clings to the wall of a freeway on-ramp, persisting though never tended to. How does it survive all that carbon monoxide? This restaurant is located in Chinatown at 7th and Franklin just east of Broadway. The core of this community is about eight blocks square. This building has been here for ages as its sagging balcony attests to. In the nearby markets you can buy the most unusual produce that you won't find anywhere else. It looks like Santa was taking a break while making his rounds. Here he's just taking off again. This holiday display is in Mt. View Cemetary at the top of Piedmont Avenue. Hope he brings you what you wished for. 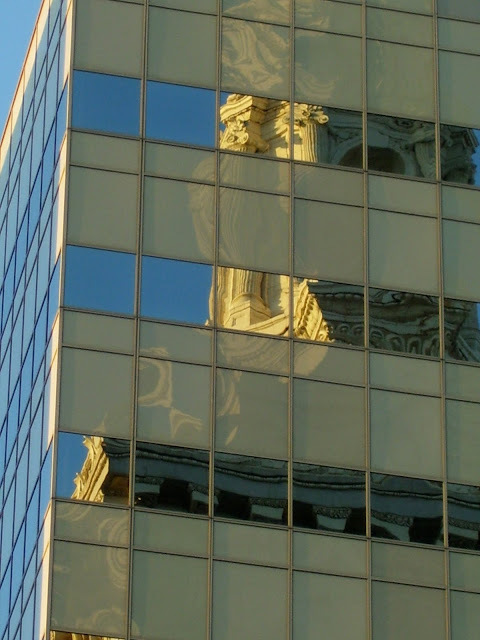 This striking structure is a new addition to the architecture of Oakland. 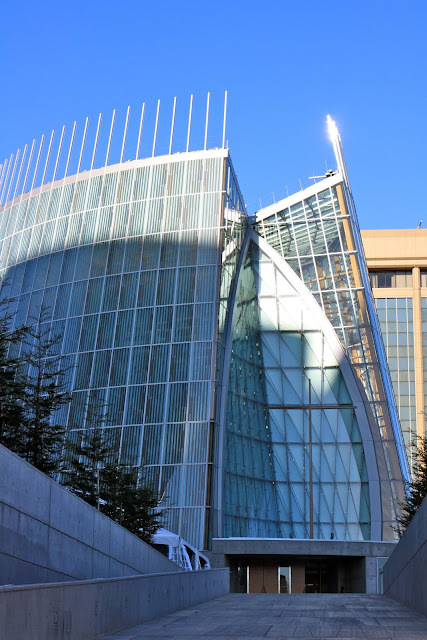 It opened this year and is situated directly across from Lake Merritt. The interior of the church feels like the hull of a ship. Downtown Oakland is in the foreground with SF in the background. You can see one span of the Golden Gate Bridge on the right. This photo was taken from the Mormon Temple. The low slung cloud cover in the background is actually the fog coming in from the ocean. For 30 years homes on two blocks of Picardy Drive have decorated profusely for the holiday season. This residential street often has traffic jams due to those driving by to see the display. There's added charm because most of the houses are designed in the "storybook" style which enhances the fairyland feel. Picardy Dr. is in east Oakland near Mills College. This sidewalk altar is in Jingletown, until recently a primarily Latino neighborhood. 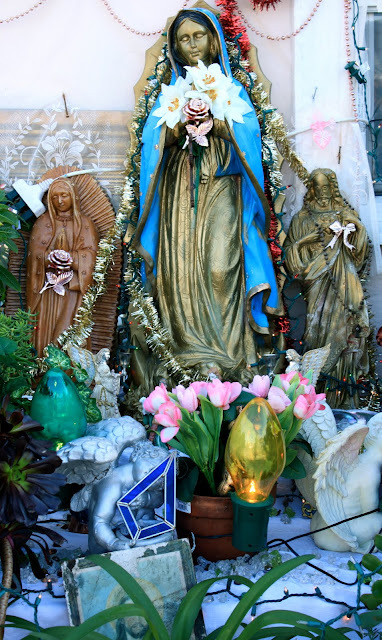 Although the display is kitschy, it remains respectful of the Virgin of Guadalupe. Her feast day is celebrated in Mexico on December 12. Window security bars at Automania in Jingletown. Jingletown, an east Oakland neighborhood bordering on the estuary, is home to many artist studios. You'll find them tucked in between factories, warehouses, and turn of the century housing. A walk in the neighborhood reveals artistry and wit. 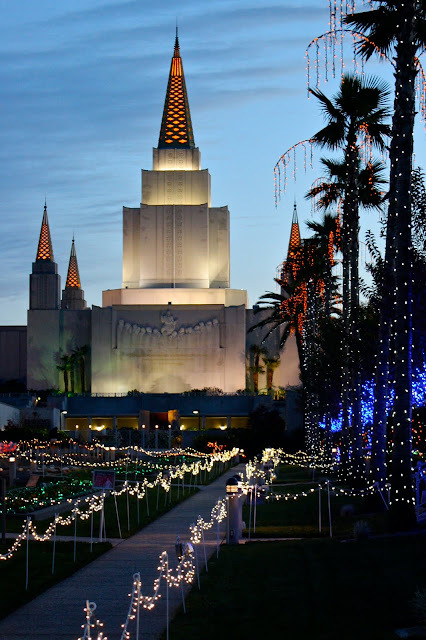 The Mormon temple is in the Oakland hills on Lincoln Avenue. Its Christmas lights draw folks from all over. Its location also offers beautiful views of the bay. These container cranes line the estuary and its opening onto the bay. They always remind me of Starwars creatures. You can see the SF skyline peeking up from the horizon. 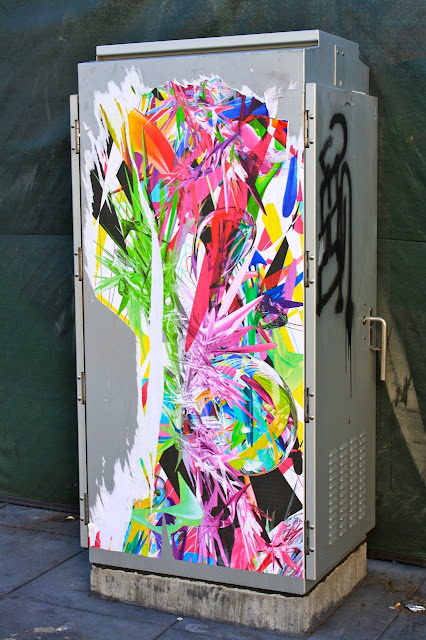 Oakland has tons of public murals. 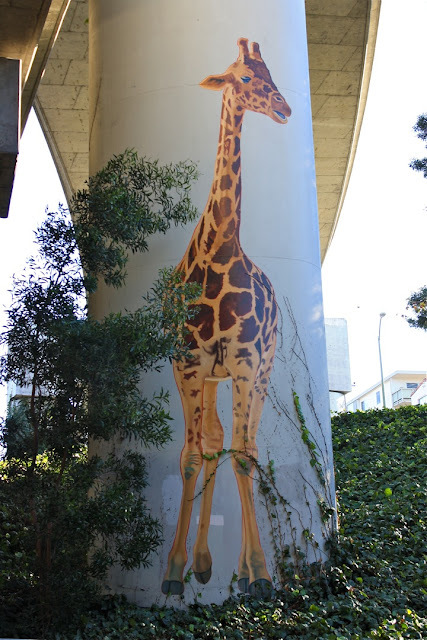 This 32-foot tall giraffe by Dan Fontes is on a support pier of the 580 freeway at the Harrison Street on-ramp. The city contracted with Dan in 1983 to create seven (!) giraffe designs for spaces under the freeway. In 1994, after piers were wrapped in steel sheeting for earthquake safety retrofitting, the highway department contracted with Dan to repaint the now hidden original. Who says vast State bureaucracies don't have an aesthetic heart? Anyway, this knock-kneed giant always makes me smile. And an attitude adjustment prior to entering the traffic crawl is always a good thing. This is Millionaire's Row, where the movers and shakers of the late 19th and early 20th centuries built impressive burial monuments to themselves. I like the way the stones glow just before sunset. Mountain View Cemetery was designed by Frederick Law Olmstead (of Central Park fame) and opened in 1863. Like Oakland today, it welcomed people of all faiths and races, which was unusual for the period. It's located at the end of Piedmont Avenue. There are over 200 acres of beautiful landscaping which invite walkers and joggers. The cemetery offers incredible views of the SF bay and four of its bridges. All Oaklanders love Lake Merritt--The Jewel of Oakland. Located just east of downtown, it is a large tidal pool (155 acres) that flows from the estuary. The lake is situated in an area populated with apartment buildings, private homes, government buildings, and retail businesses. The lake draws large numbers of people every day who walk, run, bike, sail, and row. A weekly Farmer's Market is nearby and we even have a gondola for hire! My favorite feature is the Necklace of Lights that circles the lake. Inaugurated in 1925, the lights were turned off during WWII. The necklace began to glow again in 1985. This symbol of Oakland can be found on all city and public school vehicles, websites, and stationary. This large, old tree is in front of City Hall in Frank Ogawa Plaza. The oak tree symbol refers back more than 150 years when the East Bay was covered in oak forests and Oakland was the local vacation spot and rural getaway for San Francisco citizens. Oakland's population grew significantly after the 1906 earthquake.